(Bloomberg) -- European equities advanced, poised for the biggest monthly gain since October 2015, as investors embraced Federal Reserve’s patient stance, while energy stocks rallied after Royal Dutch Shell Plc’s earnings beat estimates. 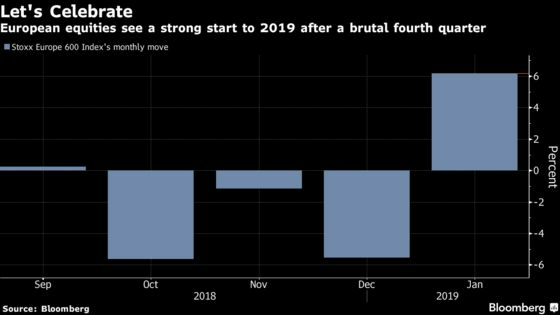 European equities started 2019 on a positive note after losing 12 percent in the fourth quarter in the worst result since 2011 as traders were shaken by fears of a global slowdown and higher rates. The Federal Reserve said on Wednesday it will be “patient” on any future interest-rate moves and signaled flexibility on the path for reducing its balance sheet, fueling gains in stocks globally. “European stocks are rising broadly in line with other equity markets year to date. The drivers are common ones: valuations are more attractive, central banks are on hold, as in Europe, or more supportive, as in the case of the U.S. and China, and there is optimism that the U.S. and China will reach an agreement on trade matters,” said Andrew Milligan, head of global strategy at Aberdeen Standard Investments.“Investors await more evidence about the global trade cycle improving in ways to help European stocks before they will decide to change from a rather underweight to a more overweight position."